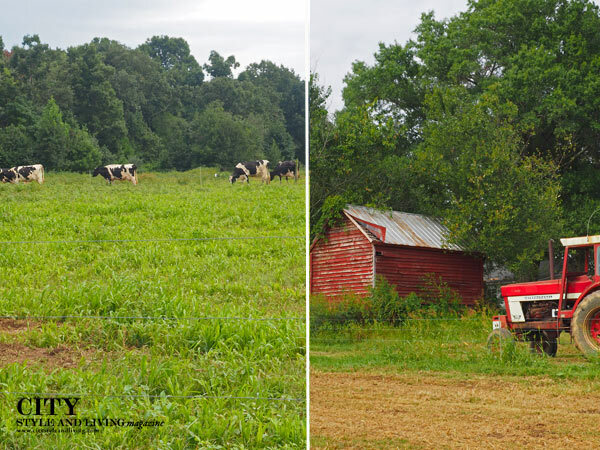 From left: At Happy Cow Creamery the Holstein cows graze, a barn on the dairy farm. 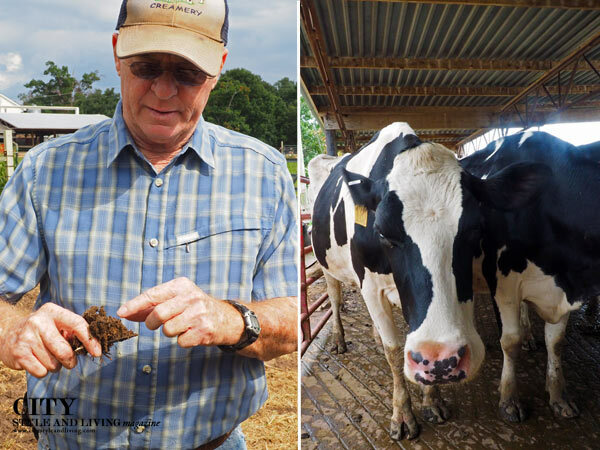 Happy Cow Creamery Tom Trantham inspecting the compost like soil of his dairy farm; a cow waits to enter the milking facility. Happy Cow Creamery, the 100 acre dairy farm in Pelzer, South Carolina owned by the legendary Tom Trantham, exemplifies an unbelievable story of Steinbeck proportions. Trantham whistles to a young man using a forklift to transfer an unwieldy number of palettes and says firmly but kindly, “That’s enough.” Tellingly, I glance at the boy, his curly hair blowing in the wind and in his eyes are a mixture of respect, eagerness to learn and submissiveness. With a litany of experiences, of defeat and triumph, of desperation and progress, it is not surprising Trantham has something to teach. As we tour the farm, there is an unbelievable story of Steinbeck proportions at every turn. Beginning in the grocery business with his father aged 12, Trantham shifted to his dream of being a dairy farmer first in North Carolina and eventually here. In the years that followed, “things were real good,” he was top in the state at a time when there were approximately 500 dairies (today only 75 remain). His success led to a cycle of borrowing from the bank for bigger and better. Farms though echo the vicissitudes of life and in 1986 Trantham was the epicenter of the worst drought in the region in a century. Foreclosure loomed everything was in shambles. It was the fortuitous arrival of a news crew documenting the devastation that led to a surreptitious call from fellow farmer Mr. Pauley of Illinois offering Trantham his surplus of hay. Trantham, at first could not accept the offer because he had no means of transporting it, but eventually government and private sector help led to it becoming the largest farmer-to-farmer event in US agriculture. Eventually, $2.5 million worth of hay was distributed to family farms. “No money ever exchanged hands,” he says proudly. Today, the farm produces low-temperature pasteurized milk, buttermilk and butter sold onsite and at grocery stores throughout the region. In the bottling plant he tells of how he was able to get his milk into a major regional retailer without the normally requisite barcode. “The barcode has been detrimental to family farming. It’s not a money issue it’s a moral issue,” he told the district manager of a retail grocery chain who agreed to stock his milk. As we stop near some grazing cows he looks shocked at his own success. “I can’t explain what this is,” he says in disbelief as he shares how the farm has become attractive to innovation. Decades ago one of his favourite cows broke her legs in the mud. Searching for a solution he finally landed upon geotextile fabric normally used for road construction. He was given thousands of yards of the mesh by a manufacturer and it now appears on the USDA suggested list. Outside, he offhandedly remarks that the rooftop hot water heaters “we got.” A manufacturer looking to partner with a farm heard of Happy Cow Creamery’s work and sent them. In the newly built warehouse and cold storage centre Trantham’s pride is evident. “Today money’s what counts. It used to be that farmers had competition because they wanted their products to be the best. That was the motivation,” he says, his tone part conviction, part humour that speaks to an unbreakable spirit. Throughout our conversation Trantham peppers his stories with, “this is over my head,” as if to explain how everything he needed came at the right time without relinquishing his values. An abbreviated version of this article originally appeared in the Winter 2014/15 issue of City Style and Living Magazine.